The US President has approved the sale of two missile defence systems for Air India One. 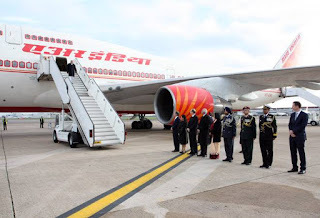 The two missile defence systems- Large Aircraft Infrared Countermeasures (LAIRCAM) and Self-Protection Suites (SPS) will enhance the security of planes flying the Prime Minister and the President of India. LAIRCAM protects large aircrafts from man-portable missiles. LAIRCAM system increases crew-warning time, decreases false alarm rates and automatically counters advanced intermediate range missile systems. The missile warning subsystem will use multiple sensors to provide full spatial coverage and the counter-measures subsystem will use lasers mounted in pointer-tracker turret assemblies. The countermeasure systems will also automatically counter advance intermediate range missile systems with no action required by the crew. SPS will also facilitate a more robust capability into areas of increased missile threats. These defence systems would be installed on two Boeing 777 Head-of-State aircrafts which carries the President and the Prime Minister. Q. Who has approved the sale of two missile defence sytems for Air India One?